It's not every day that a start-up founder wakes up to appreciation from business magnates such as Richard Branson. 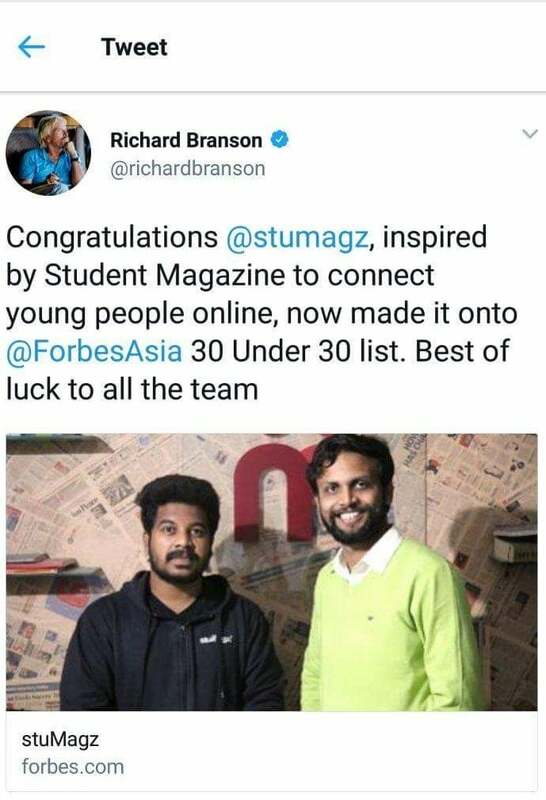 But for the founders of Stumagz, Sri Charan Lakkaraju and Frederick Devarampati, the day arrived in all its glory when Branson, the founder of Virgin Group, tweeted about their start-up and wished them good luck. Stumagz's innovative idea, which is to create a digital campus ecosystem for colleges, has been inspired by Branson's first venture Student magazine. When Lakkaraju and Devarampati got featured in the Forbes 30 Under 30 Asia list, Branson took to Twitter to shower luck on them and acknowledge their work. Entrepreneur India spoke to Lakkaraju about their work and how Branson's tweet could potentially change the game for Stumagz. When Lakkaraju worked as a skill development trainer, he visited many colleges and spoke to students. He realised that affiliated colleges in Tier II and Tier III cities faced lack of opportunities and zero visibility for students. That's when Lakkaraju thought of creating a digital platform that could work as a 'LinkedIn' for colleges. "Since then, we have evolved into creating a digital campus ecosystem. Today, we have more than 300 colleges that have partnered with us, with over 30 companies actively recruiting through us," he said. On their platform, every student has a profile that showcases their skillset. Lakkaraju believes that the platform works as more than just a resume for students. Besides helping them get recognized, it converts their campus into a digital one. "Through push notifications, we have done away with the age-old process of sending out circulars to notify students about various college activities," he said. Not just that, they have also managed to inculcate the payments' process on their platform. Colleges in India have long been relying on challans or paper documents to process the fees of students. Through Stumagz, students can plug in their roll numbers and pay their tuition fees digitally. Another innovative initiative on their platform makes way for a two-way digital interaction between students and teachers, similar to communication and management platforms such as Slack. "It's like a chatbot where students and teachers can interact, the latter can even assign tasks on the platform," he said. With Branson's appreciation coming their way, Lakkaraju is confident about striking more partnerships with colleges and students. "It's amazing when an entrepreneur of that scale tweets about you. Branson has over 12.5 million followers and now they know about us. I have been inundated with calls and it's a great validation," he said. Is a partnership or investment from Branson in the works? The answer to that was yes. "We are in talks with them and let's see how it turns out for us," said Lakkaraju.